Scientific project of the globalization of university of Baghdad Globalization has become a big concern for all scientific and administrative departments of Baghdad university after receiving a torrent of great and global achievements to be today in line with the advanced ranks of major universities so that to have a new vision for education in accordance with a global perspective while bringing out all that helps the capacity of researchers, professors and students at the university, and with this renewed vision, the department of quality assurance and university performance seek to achieve a new turning point for professors and researchers through engaging in practical workshops to embrace its great ambitions. In the presence of the adviser to the minister of higher education and scientific research, Dr. Muhsin al-Friji, a symposium of the international experts institute of the united nations was held at the faculty of physical education and sport science to introduce its work, objectives and mechanism, attended by prof. Dr. Alaa Abdul Hussein Abdul Rasool, president of Baghdad university and prof. Dr. Riyad Khalil khammas, administrative assistant of the university president with a large number of experts, scholars, intellectuals and students, in addition to the presence of a representative of the ministers’ presidency and non-governmental organizations. The minister advisor, Dr. Muhsin al-Friji praised Baghdad university, its scientific competencies and facilities, stressing the view of Dr. Alaa Abdul Hussein in his speech that the university is comprising of a large group of scientists and intellectuals who can obtain global certificates in international arbitration or international experience, but the circumstances that our country experience has not been given the opportunity to gain an academic maturity as the rest of world universities, but the time has come take its international standing via its accumulated experience and its scientific achievements, especially since a great number of researchers have published their researches in the most prestigious scientific journals of impact factor, as well as getting advanced ratings globally. 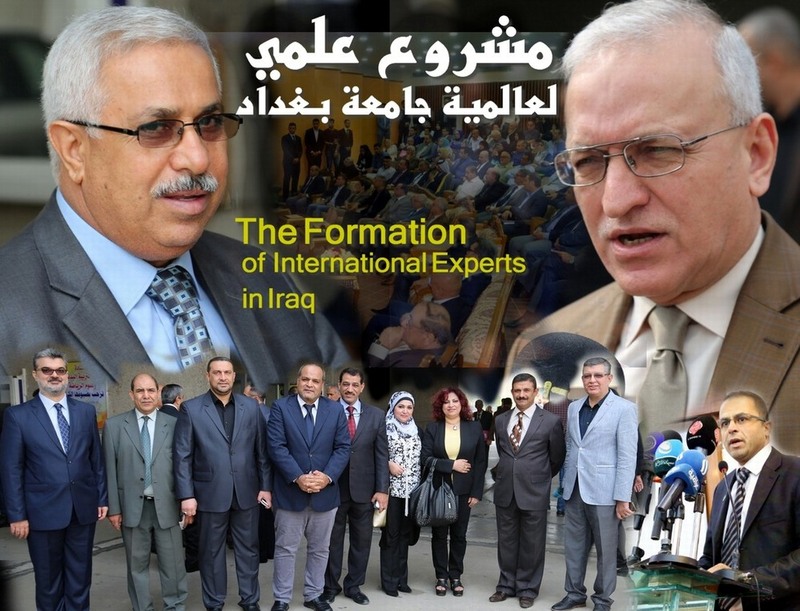 The director of the international experts’ institute in Iraq, Maha al-Amidi explained that the international experts body in in Geneva, Switzerland has inaugurated for the first time an institute at the Middle East, in Baghdad for the purpose of creating international experts in Iraq in all fields under the supervision of international experts in Switzerland to represent Iraq in international conferences and upgrading the academic and scientific level of this elite. She explained to the news center at Baghdad university that the international experts institute is configured through a set of states that is interested in create a group of experts and it is a scientific institute for professional purposes such as (agriculture, real estate, food industries and criminal evidences) and that all international experts institutes consist of seven units including control of environment and task frame and the duration of the study is ten months by which the candidate in Iraq obtains the identification of an international expert recognized by the international experts’ body in addition to a passport of an international expert so that he would be registered automatically in the international experts record, referring to twinning the institute in Iraq with the of experts formation in Grenoble, France so that Iraqis are allowed to get admission to this institute to attend conferences and visit the United Nations, as well as allocating special fees for Iraqis for booking airline and hotels, the university website team and TV channel office accompanied that meeting and documented it by photos and video scenes. After being on paper before a year or two, the dream has become a reality and a global project to assist scientists, professionals and specialists in technology that forms a new scientific and technological incubator for university of Baghdad added to the existing scientific laboratories in all technological fields. 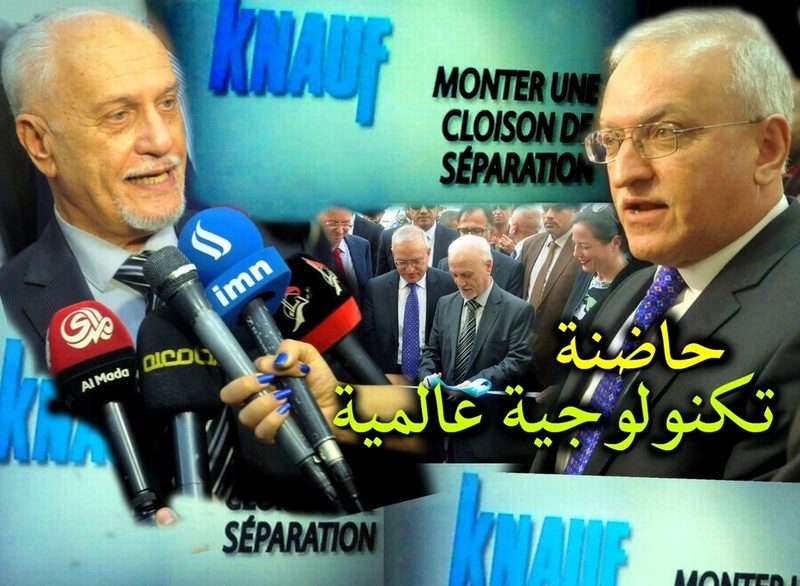 Minister of higher education and scientific research, Dr. Hussain al-Shahristani, inaugurated the technological incubator of dry construction for training students and instructors specialized in engineering at university of Baghdad with collaboration with the German “Knauf” group. His excellency minister of higher education and scientific research, al-Shahristani said at the opening ceremony, attended by German ambassador in Baghdad “Eckhard Preveza” that the ministry of higher education is keen on providing the latest technologies for universities and research centers in order to employ the knowledge and technology needed to provide outstanding products and services, stressing that the technological incubator is accomplished by the agreement with the German “Knauf” group for training students, professors and private sector companies to provide them with the necessary expertise for successful projects. His excellency, the minister invited all engineering colleges and the ministries concerned to be proactive in staff training, participation in workshops organized by the German company working at the center, so that to turn Iraqi universities into producers to meet the needs of the community and achieve development. For his part, the president of university of Baghdad, professor Dr. Alaa Abdul Hussein Abdul Rasul stated that the opening of this center is the result of a two-year effort, that aims to eliminate the phenomenon of unemployment and job creation for youth, as well as expand marketing to product companies working in this field for rapid and inexpensive dry construction. President of the German group, “Isabel Knauf” expressed their readiness to accomplish construction projects since there is (220) laboratories spread all over the world, stressing that this technological incubator on (2500 m²) at the university of Baghdad during at least 25 years by specialized German staff to eliminate the phenomenon of unemployment and job creation as well as providing the opportunity for all trainees. TV university channel office and website team accompanied this event and documented it with a number of photos and videos. After receiving many merits as a prestigious and a significant university among our educational institutions, several world and international federations went looking around our university as a great and an ancient university, particularly when recently it became in line with other international universities through world rankings and global cultural and intellectual events such as QS and Webometrics. 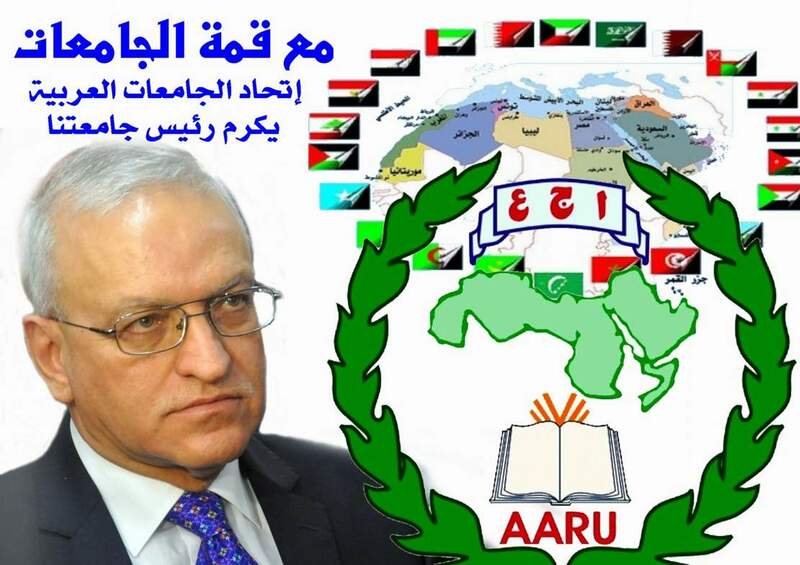 The association of Arab universities honored university of Baghdad for its intellectual and leading role as a sober educational institution, through honoring its rector, Dr. Alaa Abdul Hussein for his distinguished role in this association. The university has sent prof. Dr. Riyad Khalil, the administrative assistant of rector to the headquarters of that association in Jordan for attending its meetings where our university was honored as the best Iraqi university to represent Iraq globally. Dr. Riyad Khalil handed the shield to the university rector, prof. Dr. Alaa Abdul Hussein in the presence of Dr. Abdul Bassit Salman, editor of the university website and Dr. Adel al-Ghurery, director of media relations at the university. Dr. Alaa Abdul Hussein had contributed via his active role in reflecting a new impression on our university that was experiencing several problems already caused by the effects of war, siege and occupation, while at present it stands tall to renew the glories of the past as a patron of culture, science and as a pioneer of human thought. Dr. Alaa Abdul Hussein, university president expressed his delight for this honor that came as a fruit of the efforts of all members of the university members, professors and students and that this honor is dedicated to the heroes of the popular crowd and our Iraqi army who resist the fierce attacks of terrorism to ensure a safe life for us, we stand as a tribute to them and may almighty God bless. Prof. Dr. Riyad Khalil, administrative assistant regarded this honors as a great scientific triumph counted for the university amid the harsh conditions faced by the country, stressing that Baghdad university is the only Iraqi university that received it confirming that our university is at the top through the efforts of good people and the ministry of higher education and scientific research which is something that make us proud as being within its members. Dr. Alaa Abdul Hussein had received many congratulations and blessings and the university website team and TV channel office accompanied this event and documented by series of photos and video scenes.